With an impressive 732,000 Twitter followers, Megaupload founder Kim Dotcom is no lightweight on the social networking platform. Unfortunately, however, some people are trying to exploit the entrepreneur's popularity in order to scam cryptocurrency from the public. Thankfully, the tricks of the criminals are easily avoided. 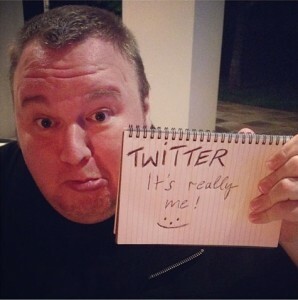 For the past several years, Twitter has been the platform most used by Kim Dotcom to get his messages out to the public. Whenever there’s been a development in his long-running case, Twitter is usually the first place to find up-to-date information. With his larger-than-life persona, Kim has developed a huge following. He currently has more than 732,000 followers on his official account, something that hasn’t gone unnoticed by those looking to generate profit from his significant profile. Kim’s tweets are regularly piggybacked by criminals seeking to trick the public into handing over cash. Exploiting a weakness in the way Twitter displays tweets and replies, they’re able to use fake accounts that look like his in order to promote their agenda. As the image above shows, a genuine Tweet by Kim to his followers is followed by others which claim to be him giving away cryptocurrency. Upon closer inspection, however, it’s clear that while the names and images match, the underlying Twitter usernames are quite different. This particular scam leads to a Tumblr blog which has Kim’s name in the URL. For added credibility, it also adds a ‘Medium’ logo at the top and a faked “13.2K” claps at the bottom. In the middle, the offer is made clear. “It has been an exciting past year. Thanks to your support, I am giving away 10,000 Ethereum!” the fake Kim Dotcom writes. “To identify your address, please send .5-10 ETH to the payment address and I will immediately send you 5-100 ETH back to the address you sent it from. If you are late, your ETH will be instantly returned. Needless to say, the offer of free cryptocurrency is completely fake, with the scam designed to part Kim Dotcom fans from their money. 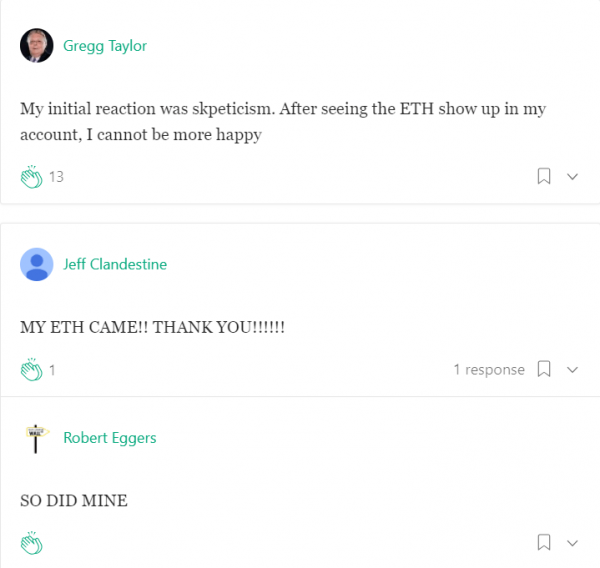 For added effect, the blog post has plenty of comments (all fake of course) which falsely claim that ETH has been sent to “Kim’s account” and he has been kind enough to send plenty back for free. With some fake users claiming to have received as much as 55 ETH from Kim (1 ETH is currently around $460.00) the temptation must be high to get involved. Rest (un)assured, there’s only one person getting rich from this scam. Unfortunately, several groups have jumped aboard the gravy train. As can be seen from the image below, scammers are jumping on Kim’s recent tweets to promote their criminal activity in the hope that people hand over their hard-earned cash. These attempted scams aren’t new and have been going on for some time now. However, on the back of the news this week that Kim’s latest effort to avoid extradition to the United States has failed, the scammers are jumping onto Kim’s posts and exposing thousands more visitors to fraud on a larger scale. Thankfully, there’s some advice from the genuine Kim Dotcom on how to easily avoid online criminals exploiting his name. “Unfortunately there are many fake Kim Dotcom accounts on Twitter offering free gifts and free crypto. Don’t fall for those scams. The only real Kim Dotcom account on Twitter is the one with the blue verification tick next to my name,” he previously explained.